What You Need to Know about Pinhole Surgery in Washington D.C. Your teeth need healthy gum tissue to stay healthy for a lifetime — and they require plenty of it. 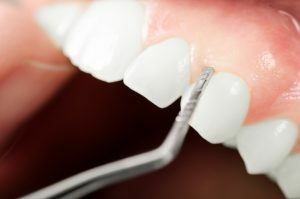 If you have had gum disease or severe gum recession, your dentist may recommend a non-surgical procedure called the Chao Pinhole® Surgical Technique. What is it? What are the benefits? And is pinhole surgery right for you? Keep reading for the answers to these and other questions about gum regeneration. Gum recession is when the periodontal (gum) tissue pulls away from where it should be against the teeth. Aside from the cosmetic issues that arise when the teeth look longer than they really should, gum recession can cause oral health problems like tooth sensitivity and even tooth loss. Recession can be the result of gum disease, aggressive tooth brushing, and certain medications. Traditional treatment for gum recession requires a scalpel and sutures. Healthy gum tissue is removed from elsewhere in the mouth and sewn onto the area where it has been lost. The pinhole technique, by comparison, offers a nonsurgical treatment that minimizes discomfort and bleeding. Using the pinhole method, your dentist creates a small hole in the gums and pulls healthy tissue into the area where it is lacking. Collagen is then inserted to stimulate the growth of new periodontal tissue here. Over the course of several months, healthy tissue is generated and recession is corrected. Who Needs Pinhole Gum Rejuvenation? If you have had periodontal disease or are dealing with the unsightly effects of gum recession, pinhole surgery may be a wonderful option for your smile. To find out for sure, schedule an appointment with your dentist who offers this solution. This is the only way to repair missing gum tissue without the need for gum grafting, stitches, and sutures! Dr. Yelena Obholz is a general dentist offering comprehensive dental services to patients in and around the Washington D.C. area. She is specially certified to provide the Chao Pinhole® Surgical Technique for gum recession. To learn more about this procedure or to schedule an appointment for any other general, restorative, or cosmetic treatment, go ahead and contact the office by calling 202-364-8989. Comments Off on What You Need to Know about Pinhole Surgery in Washington D.C.